Myanmar Gets Civilian Leaders, But The Generals Keep Close Watch : Parallels For the first time in more than a half-century, Myanmar is being governed by civilians, including Aung San Suu Kyi, who is the foreign minister. But the military still has considerable clout. 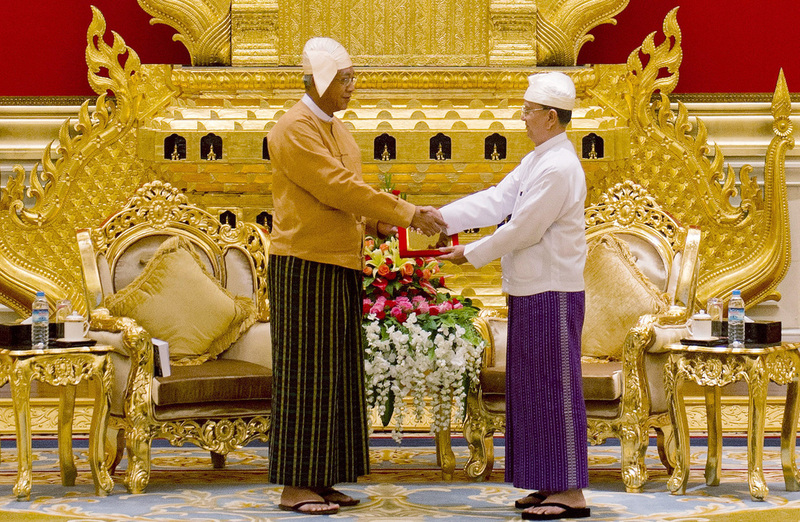 Myanmar's new president U Htin Kyaw (left), receives the presidential seal from outgoing president U Thein Sein during a handover ceremony at the presidential palace in Naypyidaw on Wednesday. The military ruled Myanmar, directly or indirectly, for more than a half-century. Thein Sein, an ex-general, has guided the country from military dictatorship to a fledgling democracy over the past five years. He now plans to head to a Buddhist monastery to be ordained as a monk, according to media reports. But few of Thein Sein's fellow generals and ex-generals will be heading into such an ascetic future. Despite suffering a crushing defeat in November's general elections, the generals had already drafted a constitution that still leaves them with a de facto veto in parliament and control of all security matters. They could even suspend or reverse the country's progress towards democracy if they don't like the way things are going in Myanmar, also known as Burma. Suu Kyi, who will hold several posts, including the job of foreign minister, "is likely to remain relatively cautious," recognizing that "her best early moves are going to require her to keep the military power brokers on side," says Nicholas Farrelly, an expert on Myanmar at the Australian National University. She must also perform an "awkward dance" with the leaders of ethnic minorities, some of which have been waging civil war for decades in a bid for autonomy and control of local resources. Under a law written by the generals, Suu Kyi is constitutionally barred from the presidency because her late husband and her sons are foreign nationals. So she has picked the president, Htin Kyaw, as her proxy, and she is carving out a role for herself as "super minister" in charge of four portfolios: education, foreign affairs, energy and the president's office. Aung San Suu Kyi (left) speaks with military generals during the presidential handover ceremony in Naypyitaw, Myanmar on Wednesday. Suu Kyi, a Nobel Peace Prize laureate, will hold several top positions in the new civilian government, including the post of foreign minister. Her party, the National League for Democracy, introduced draft legislation on Thursday that would create a powerful new position of "state adviser" just for her, although it's not clear whether such an arrangement would be constitutional. "One could argue that she is putting in place the building blocks for ultimately either a challenge to the constitution itself or to acquire the powers of the president without having to change the constitution," says Vikram Nehru, a senior associate in the Asia program at the Carnegie Endowment for International Peace. Nehru warns that by taking on so many cabinet portfolios, Suu Kyi is setting herself up to take a lot of blame for any policy failures. 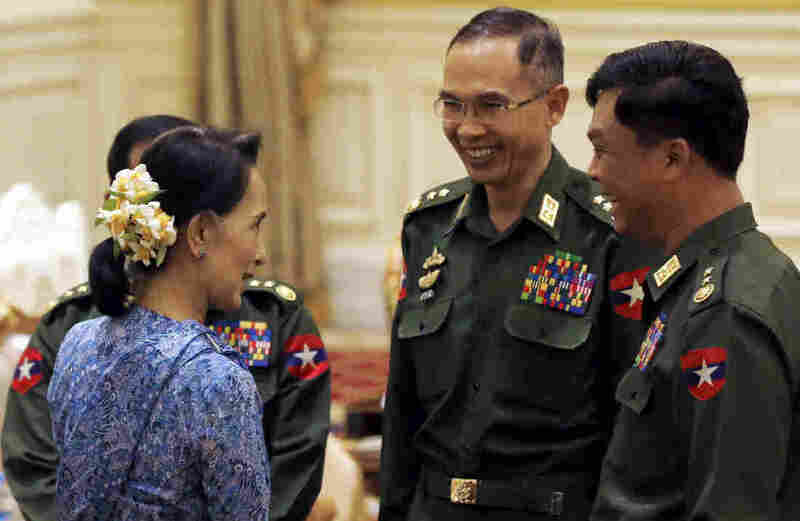 Some observers argue that this was the role the former military leaders had in mind for Suu Kyi all along, as they laid out a political roadmap for how they could hang onto power and cast off international pariah status and crippling economic sanctions in one fell swoop. The architect of this roadmap is none other than the ex-junta leader, former general Than Shwe, who reportedly retains considerable political clout even in retirement. "This is the kind of retirement I think he probably would have dreamed of," says Farrelly. Myanmar's economy will grow at an 8.4 percent clip in the coming fiscal year, according to a forecast by the Asian Development Bank. The country is at peace with its neighbors. And Suu Kyi has indicated that she will not seek legal action for abuses committed by the former ruling junta. Than Shwe "has got mansions in which he can while away his days," Farrelly says. "Given the amount of loot that has been squirreled away by the retired senior general and some of his close acquaintances, they'll be in a pretty strong position for — let's be frank — generations to come." Meanwhile, Suu Kyi's National League for Democracy must transform itself very fast from a pro-democracy movement into a governing party. Suu Kyi is 70 and has no apparent successor. She works closely with an inner circle of trusted confidants who have assisted and protected her through years in political opposition and house arrest. Farrelly predicts this personal style of rule is not likely to change soon. "Aung San Suu Kyi feels herself to have a particular responsibility for dragging her country out of the dictatorial darkness, and in doing so, fulfill the destiny of her father," he says. Her father, Gen. Aung San, helped negotiate Myanmar's independence from Britain in 1947, but was assassinated shortly afterward. The Carnegie Endowment's Vikram Nehru points out that Myanmar is one of the poorest countries in Asia and is well positioned to take off economically. "Myanmar is the last untapped frontier in Southeast Asia," he says. "There are enormous investment opportunities here, provided the government adopts sensible economic policies and maintains political stability."